No, Al-Qaeda doesn't dominate the Syrian opposition. 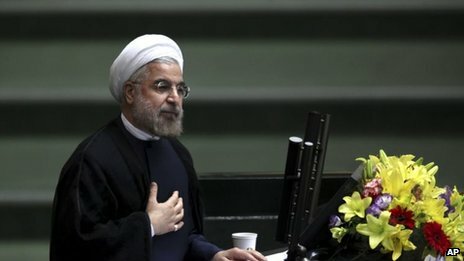 Iranian President Rouhani didn’t offer Jews a “Blessed Rosh Hashanah” -- the English-language tweet reported around the world yesterday was a hoax, according to Rouhani’s spokesperson Mohammad Reza Sadeq, and Iran’s official Fars News Agency. The fake message was widely reported by Western journalists, none of whom appear to have done any fact checking, since Rouhani doesn’t even have a twitter account. Media outlets, especially left wing ones, have been eager to portray Rouhani, a ruthless regime insider, as a moderate. Those reporting on Rouhani’s fake tweet included CNN, The Washington Post and the Israeli anti-Netanyahu paper Ha’aretz. Leading Iranian: “If Rouhani is moderate, I’m the Jolly Green Giant”. Britain’s biggest bookseller promotes Mein Kampf for Christmas (& other stories). Smadar Bakovic (also written as Berkovich), an Israeli postgraduate student at Britain’s prestigious Warwick University, has finally won an official apology and £1,000 compensation from the university after her dissertation was deliberately given a poor mark purely because she was an Israeli Jew. The low mark was awarded by Nicola Pratt, associate professor at the university’s politics and international studies department. Pratt is known for her attacks on Israel, which she has made in letters to The Guardian and elsewhere. The university authorities allowed Bakovic’s dissertation to be re-marked by other professors overseen by an external examiner from outside Warwick University, and she obtained a distinction, with a much higher score than Pratt awarded. However, the authorities at Warwick University are refusing to discipline Prof. Pratt, and there has been remarkably little national newspaper coverage of this story in the British press. One wonders if there would have been so little media coverage if a student was marked down by a politically active professor at a top university for being African, or Arab, or anything else other than an Israeli Jew. Jews visiting Judaism’s holiest site, the Temple Mount, on the eve of the Jewish New Year, cowered for safety when dozens of Palestinian men and boys, many wearing masks, began lobbing rocks at them. Israeli security forces were called to the scene. They chased the rock-throwers into mosques but did not pursue them inside. A plot by Hamas to bomb an upscale Jerusalem shopping mall during the Jewish New Year holidays has been thwarted by Israel’s domestic security agency, the Shin Bet. The agency announced it had arrested several Palestinians who belonged to a Hamas terror cell. Some of those detained worked at the Mamilla Mall, where they planned to smuggle the bomb and hide it until the time it was to be detonated during the Jewish holidays when the mall is filled with people. Steel balls to increase the deadly effect of the explosives were found together with the bomb. The Shin Bet said the cell confessed that the mall bomb was only one of a number of terror attacks they were planning to carry out. As the new school year begins in Israel, an Israeli designer has created a bomb-proof backpack that is said to protect all vital organs from the impact of an explosion using 19 layers of Kevlar fabric, the same material used in flak jackets. In the event of an attack, a child would need to pull side straps and yellow strings from the hood to create the equivalent of a personal bomb shelter. However, the steep price (almost $500) will prove off-putting to many potential purchasers.